It's time to adapt governance in a changing world. The 2008 crisis showed that the international community had been far too complacent about adapting financial governance to the effects of new technologies and changing market and macroeconomic conditions. A decade later, we find ourselves in a similar situation. The Fourth Industrial Revolution is challenging the way we organize our economies and societies, as well as cooperate internationally. To maximize the benefits and mitigate the risks of the latest technological advances, we will need to strengthen and modernize national and global policy frameworks. The current wave of technological disruption is combining with three other epochal transformations: the emergence of new ecological imperatives, particularly those concerning climate change; the advent of a multipolar world order; and an explosion of social discontent, fueled largely by rising inequality. Taken together, these developments represent a new phase of globalization – Globalization 4.0 – the trajectory of which will depend on how we adapt political, corporate, and international governance models to changing realities. 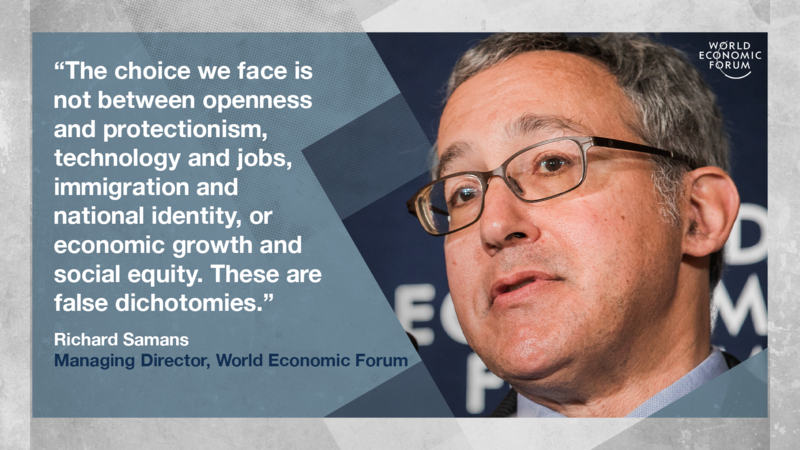 Contrary to popular narratives, the choice we face is not between openness and protectionism, technology and jobs, immigration and national identity, or economic growth and social equity. These are false dichotomies; but their prominence in contemporary political discourse illustrates how underprepared we are for Globalization 4.0. To catch up to the pace of change, we need to upgrade the “operating system” through which we cooperate internationally and govern domestically. To that end, the international community can draw inspiration from the Dumbarton Oaks and Bretton Woods conferences, the two processes of international dialogue that gave birth to the United Nations system and the Bretton Woods institutions, respectively, at the end of World War II. In each case, extended discussions created the necessary space for participants to reflect on the lessons of the recent past and reach a consensus about the design of new cooperative architecture. Today, we need an analogous but more inclusive and sustained process of reflection and dialogue about the governance implications of the technological, ecological, geopolitical, and social changes currently underway. Because these changes span countries, industries, and traditional policy domains, they demand a global, systemic response. Fortunately, because it is so universal in nature, our governance challenge is also an opportunity. It could provide the basis for a common project just when international relations are fracturing. Global cooperation toward shared goals would help to build trust between countries and other stakeholders, producing positive spillover effects across disparate social and economic domains. With the 75th anniversary of the UN and the Bretton Woods institutions approaching in 2020, the international community should mark the occasion by heeding the lesson of the 2008 financial crisis. Complacency must give way to a new process of reflection and inclusive dialogue on how to strengthen and supplement the multilateral system. With that goal in mind, the World Economic Forum has published a white paper based on consultations with a diverse range of experts before, during, and after its annual meeting in Davos in January. The paper presents eight general design specifications and 100 examples of existing initiatives and proposals that could strengthen international cooperation and domestic policy in trade, finance, climate, technology, cybersecurity, corporate governance, and labor-related policies. By spotlighting initiatives currently being led by the UN, the Bretton Woods institutions, the OECD, the World Trade Organization, the WEF, and other institutions, the paper shows that there are numerous opportunities for progress already available and awaiting wider support. Looking ahead, a top priority must be to preserve and reinforce the existing multilateral system. Humanity has made remarkable progress since WWII, and we owe much of it to the foundation of international norms and shared policy agendas established by the UN and the Bretton Woods institutions. The white paper calls for this precious institutional infrastructure to be strengthened, modernized, and embedded in a wider, multidimensional framework of cooperative arrangements – a more robust underlying operating system. We should not wait for another crisis to provide the impetus for adapting governance to a changing world. There are already numerous opportunities for deeper cooperative engagement among stakeholders at all levels. What we need now is a renewed commitment from government, business, and civil-ociety leaders to engage in collective dialogue about our shared challenges.